Arturo O’Farrill | Feel the Music! 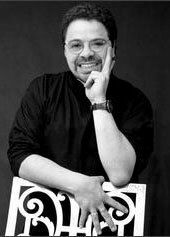 Grammy award winner Arturo O’Farrill is the music director and pianist for the Afro Latin Jazz Orchestra and founder of the nonprofit Afro Latin Jazz Alliance. Winner of the Latin Jazz USA Outstanding Achievement Award for 2003, Arturo was born in Mexico and grew up in New York City. Educated at the Manhattan School of Music, Brooklyn College Conservatory, and the Aaron Copland School of Music at Queens College, Mr. O’Farrill played piano with the Carla Bley Big Band from 1979 through 1983. He then went on to develop as a solo performer with a wide spectrum of artists including Dizzy Gillespie, Freddy Cole, Lester Bowie, Wynton Marsalis, and Harry Belafonte. In 1995, Mr. O’Farrill agreed to direct the band that preserved much of his father’s music, Chico O’Farrill’s Afro-Cuban Jazz Orchestra, which has been in residence at Birdland, New York City’s famed nightclub for years, as well as perform throughout the world as a solo artist and with his smaller groups. Besides recording three albums as a leader for Milestone Records, 32 Jazz, and M & I (Bloodlines, A Night in Tunisia, and Cumana Bop), Mr. Oâ€™Farrill has appeared on numerous records including the Grammy-nominated Heart of a Legend, Carambola, and the soundtrack to the critically acclaimed movie Calle 54. In 2002, Arturo was the featured artist in Jazz at Lincoln Center’s Jazz in the Schools Tour, when he led a Latin jazz quintet for more than 50 educational performances that reached over 10,000 students in NYC metropolitan area schools. As an educator, he has taught master classes, seminars and workshops throughout the world for students and teachers of all levels. A recognized composer, Mr. O’Farrill has received commissions from Meet the Composer, Jazz at Lincoln Center, The Philadelphia Music Project, and The Big Apple Circus. He has also composed music for films including Hollywoodland and Salud. He is currently on the faculty of SUNY Purchase and serves on the Advisory Board of Feel the Music!.